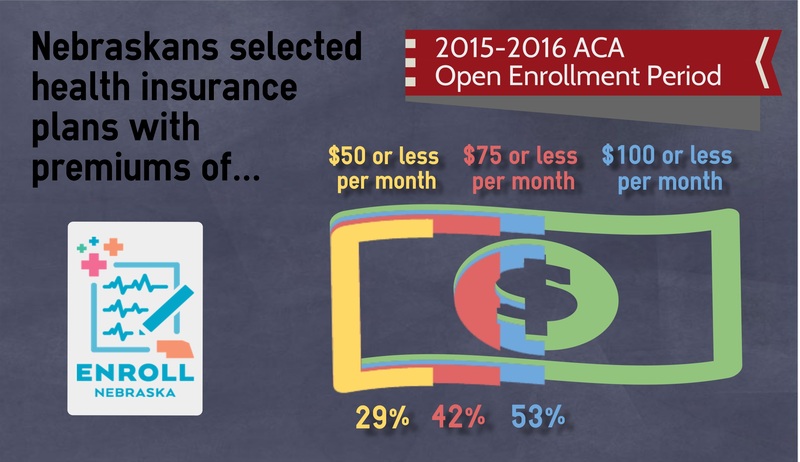 Last week, the U.S. Department of Health and Human Services issued a brief showing that customers who purchased plans in the Health Insurance Marketplace ended up paying less than the initial rates filed by health insurance issuers before the start of the 2015-16 enrollment period. The report refutes the claim of double-digit rate growth reported in many news outlets for premiums on the Marketplace, placing the actual average growth rate nationwide at 8 percent for the 2015-16 enrollment season. Among the roughly 85 percent of HealthCare.gov consumers with premium tax credits, the average monthly net premium increased just $4, or 4 percent, from 2015 to 2016. The option for customers to select new plans from the previous year also contributed to the difference between the final and initial rates, and Nebraska consumers followed suit. About 37 percent of Nebraskans who re-enrolled through the Marketplace selected a plan that cost less than the year before. New enrollees pushed average rates even lower, with about 33,000 new purchasers in Nebraska. Open Enrollment ended on January 31st, and we now have current data on the Affordable Care Act’s impact in Nebraska. Overall, Nebraska enrollment through the Health Insurance Marketplace grew nearly 20 percent from the previous year to 87,835 plans sold, with customers paying an average monthly premium of $105 per month after premium tax credits. Of those who bought on the Marketplace, 88 percent received financial help paying for their plans with an average monthly tax credit of $295, and 53 percent of Nebraska Marketplace purchasers bought a plan with a monthly premium of $100 or less. As we enter into the latest round of news coverage about rate filings and the Health Insurance Marketplace, it would be good to keep actual versus projected rate increases in mind. 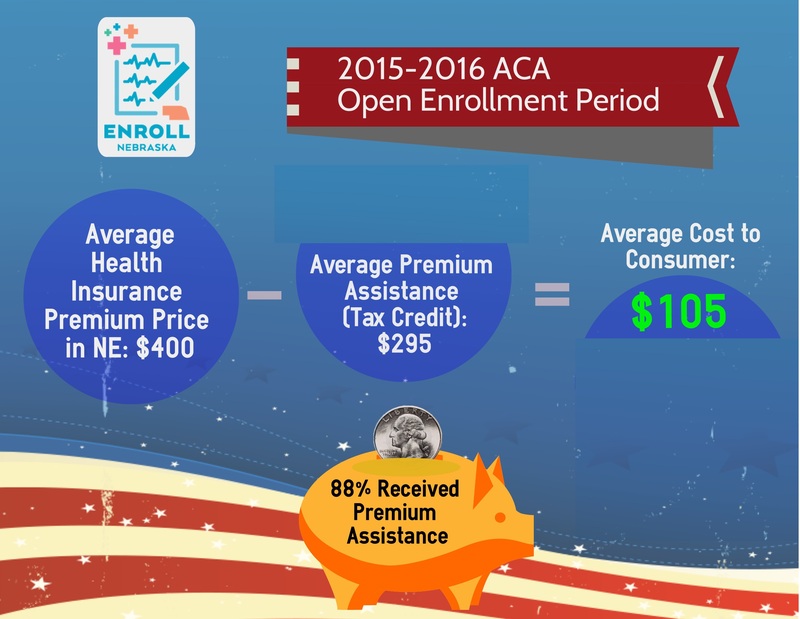 Health insurance shoppers would do well to remember to shop around during this year’s open enrollment period running November 1, 2016 to January 31, 2017. 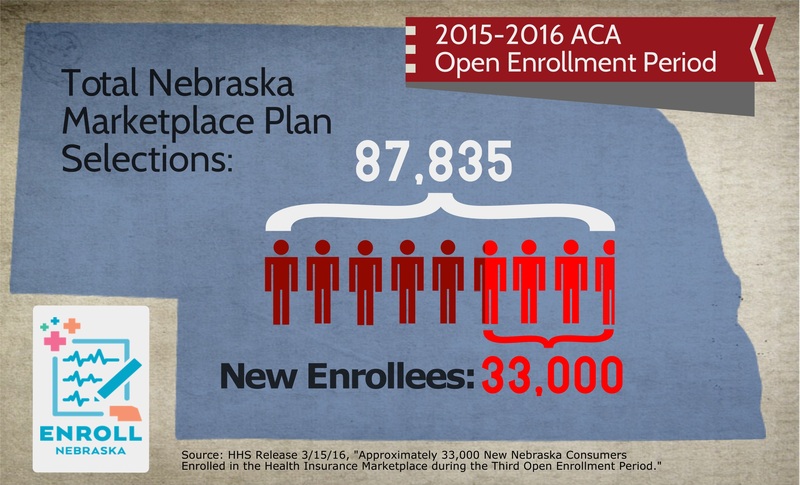 Enroll Nebraska has created shareable infographics related to Nebraska plan information on the Health Insurance Marketplace. Click the links below to download and share.